"WestRock" Logo Embroidery on Right Sleeve. Short Sleeve - Polo - Shirt - Blue - Striped -. "adidas" Logo Embroidery on Left Sleeve. Royal Blue w/ Light Blue Horizontal Stripes. AS SOON AS POSSIBLE. Sleeve Length: 10 1/2". Length: 29". Adidas Olympics patch on the right side. #12 patch on the back. Shirt is in very good condition without noticeable flaws. Very good pre-owned condition. Please see pictures for details. Tag size M Please review measurements in photos to ensure proper fit. I will ship this item within the next day of receiving payment via PayPal. I accept returns within 30 days. Thanks for looking. Welcome to Kevin's Clubhouse! Chest Measurements: Armpit to Armpit is 22 inches! $5 to ship! Thank you and please message me with any questions or concerns! Please check out the rest of my store! We appreciate the business! Color is GRAY w/White Stripes w/Adidas w/ PHILADELPHIA JUNIOR TOUR Golf Logo. be sure this will fit. " See Scan. Shirt is 100% Polyester. Armpit to Armpit is. Adidas ClimaLite line - Great quality. Yellow in color with white horizontal stripes. All of our items are in excellent condition unless otherwise noted. Color is GREEN w/ Stri pes w/Black Adidas Logo. SWEATER OR. Shirt is 100% Polyester. be sure this will fit. JACKET WON. 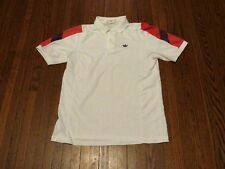 Medinah Ryder Cup Adidas Golf Shirt M Red Stripe Clima Lite Worn Once YGI 6050 Flawless, like new Photos tell the story best ... See detailed measurements of the item in photos using a tape measure -- check them carefully as sizes vary! Check out our amazing inventory of other items by including the three letters YGI in your search. For example, type in your search "pants 36x30 YGI " to see all of our 36x30 pants in inventory. STOP! Before leaving anything other than positive feedback, please contact us to work out an amicable solution. At YGI, we honor our return policy 100 percent. So, if you are unsatisfied for any reason, simply return the item for a full refund. Our feedback speaks for itself and we want to earn your repeat business. Adidas Clima Cool Original clothing item. Top to bottom 29in. 100% Polyester. Chest 22in one side. POLO SHIRT. C olor : Red White Blue. 100% AUTHENTIC . 100% Authentic. This great looking ADIDAS CLIMALITE short sleeve polo golf shirt is navy blue with narrow white stripes and a white ADIDAS logo on the center back shoulder. The shirt has been very gently worn and well cared for with no stains, fading or tears. Clima Lite. Cypress / Frost. Polo Shirt. 100% Cotton. jerseys or apparels worn loosely. We would love to have the chance to make it right. Up for sale: Adidas Penn University Golf Striped Polo Shirt. Condition: Very good pre-owned condition, standard wash and dry. No major/notable flaws and plenty of life/wear remaining. Polo Collar. 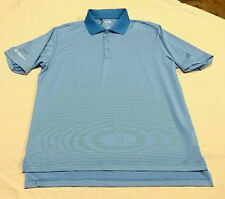 A Perfect Addition To Your Quality Golf Shirt Collection. Sleeve Length (From shoulder hem to end of sleeve): N/A. Short Sleeves. Colors: Red w/ Black Stripes. Mid Shoulder to Bottom Hem: 27.5". Small mark of discoloration on back from storage. Embroidered with Horseshoe, Southern Indiana. Length (from back of neck to bottom of shirt): 31". I am human and may miss a few things. (FORTY FIVE T H O U S A N D) shirts sold. Our goal is to always TRY to EXCEED. For More Kool Stuf' at Hot Prices! Over 45,000. Being condition is relative, and different to different people, our "interpretation" of condition is NOT given. Color Purple White Green Stripes. Short Sleeve. Notes: Great condition! No flaws found!